Consider this: electronic components will fail if they are subjected to prolonged heat such as being next to a 450 degree oven. Thus far, most slide-in and drop-in ranges or wall ovens will fail because their control modules cannot be adequately insulated from the heat generated by the oven. In 99% of the cases, these electronic components are mounted inside of an unventilated space right above the oven. In commercial applications, when electronic controls are used, they are mounted along side or beneath the oven in a well ventilated space. In talking to various people about their wall ovens or slide-in/drop-in ranges, I’ve found that most did fail if they’re used regularly for baking. The reason is the electronics are subjected to intense heat. We had a really nice Jenn-Air stove that came with our house. Shortly after we moved in, the electronic control started to fail. I then priced a new control module and found that it cost about $260 plus installation. When we lived in the prior house, I had installed a GE wall oven that had an electronic control right above the oven door. This also failed shortly after I installed the oven. This was covered under warranty and a repair person was sent out by GE to fix it. This tired fellow who smelled of tobacco smoke said that these types of ovens fail regularly. He also told me not to use the automatic oven cleaning feature because the electronics will definitely die. It was about a year later when the control failed again. This time, the oven was no longer under warranty. I called this guy and he told me that he was closing his business. I asked him if he had any of these control modules. He said he would sell me about 4 or 5 of them. I can’t remember exactly how many I bought, but I got them for about $20 each, in total for about what a new one from GE would cost. So, rather than toss the oven for a new one, I would just replace the module myself when it failed. Just before I left for our new home, I installed the last one I had in the GE. Today I understand this one has failed because someone used the automatic oven cleaning feature. I’m sure many can say they have stoves with electronics and that these don’t fail. Well, you’re right. However, these controls are located high on the back panel of the range away from the oven heat. I am talking here about wall ovens or slide-in/drop-in ranges with the controls on the front above the oven door. As my sister and father can attest to, these do fail. They had remodeled their kitchen and they bought a Jenn-Air dual fuel range. With great anticipation, they baked a large Thanksgiving turkey. Well, needless to say, we didn't have turkey that evening. She called off the feast because the oven control had failed and the turkey was way underdone. The electronics control module in these appliances is located right above the oven chamber. Though the oven is insulated, the space above it can get very hot. With repeated use, silicone electronic components will eventually fail. I sincerely believe that most people with wall ovens don’t use them very often or they too will experience regular failures. Consumer Reports rates these slide-ins and wall ovens as poor. 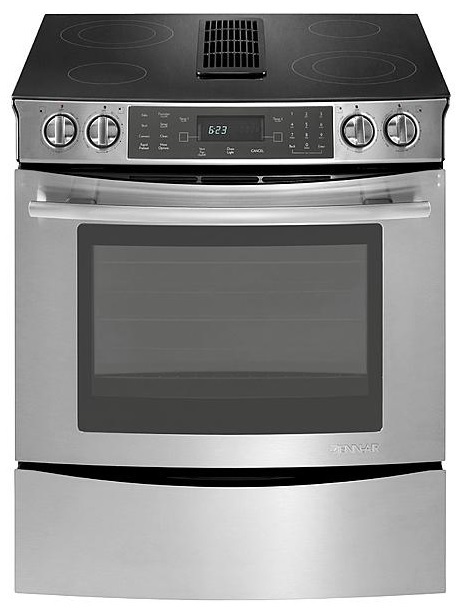 This is what drove Jenn-Air nearly out of business such that they were sold to Whirlpool/Maytag/Sears. Jenn-Air stoves were highly regarded as high-end slide-in or drop-in cooking appliances and were, relative to inflation, originally sold for over 4 to $5000. However, when the company went from mechanical to electronic controls, every one of them failed which, in the end, put the company close to going out of business. The problem was, don’t bake in the oven. The electronics fail. Jenn-Air is no longer in business. They were indirectly bought out by Sears and since then, it’s gotten to the point the name will no doubt be done away with. The not-so-junky NXR slide-in we now have has no electronics. It is all mechanical. NXR (a high-end look-alike) and Summit (basic economical) are the only two companies that still make a less expensive all mechanical stove. Wolf, Thermador, and the other high-end manufacturers do make an all mechanical range, but…very pricy. The annoying question is why do manufacturers do this? The answer is simple. Most of the type of stoves they sell is of the standard type with the controls on the back where it is easily ventilated and not directly exposed to oven heat. They then use the same controls for their wall ovens and slide-ins. If they built the control circuit such that they were remote from the control panel, the cost of a wall oven would be much more expensive than a conventional free standing stove with the controls on the top back panel. A slide-in would be even more expensive. So, these manufacturers just bet that most won’t use these ovens very often…which is true. In trying to solve my problem of the Jenn-Air range we had, I thought of modifying a module such that I could put it somewhere down near the bottom of the range running wires to the control panel. But there would have been far too many connections to be made. I then thought of finding some old mechanical oven controls from and old Jenn-Air, but they had changed the internal design so much so that this was also not feasible. After that, I looked and looked for a slide-in with mechanical controls, but there was only one, a hooky Summit range. In the end, I suffered with using a toaster oven until I stumbled across an NXR on sale at Cosco. Still, I wonder why these companies don't fix this problem. Well, like MP3 vs. high sampling-rate lossless audio, who cares. Judging by the crowded restaurants, now every night of the week, I guess most really don't care.